For added safety when you travel, keep this extra brake-light hitch cover in your receiver. Lights up to get attention of driver behind you. Long-lasting heavy-duty ABS plastic will keep for many years. Call 800-298-8924 to order Pilot Automotive hitch covers part number CR-007 or order online at etrailer.com. Free expert support on all Pilot Automotive products. 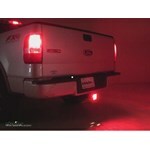 Guaranteed Lowest Price and Fastest Shipping for Brake Light Trailer Hitch Receiver Cover for 2" Trailer Hitches. Hitch Covers reviews from real customers. Distance from back of the cover face to center of hitch pin hole: 2-15/16"
Say howdy to those tailgaters with the bright red eyes of this die-cast, chrome hitch receiver cover. The bull skull's peepers light up when you step on the brake, letting other drivers know you have a sense of humor - up to a point. Chrome Trailer Hitch Receiver Metal Tube Cover - 2"
Today we're going to be taking a look at the Pilot brake light trailer hitch receiver cover, part #CR-007. 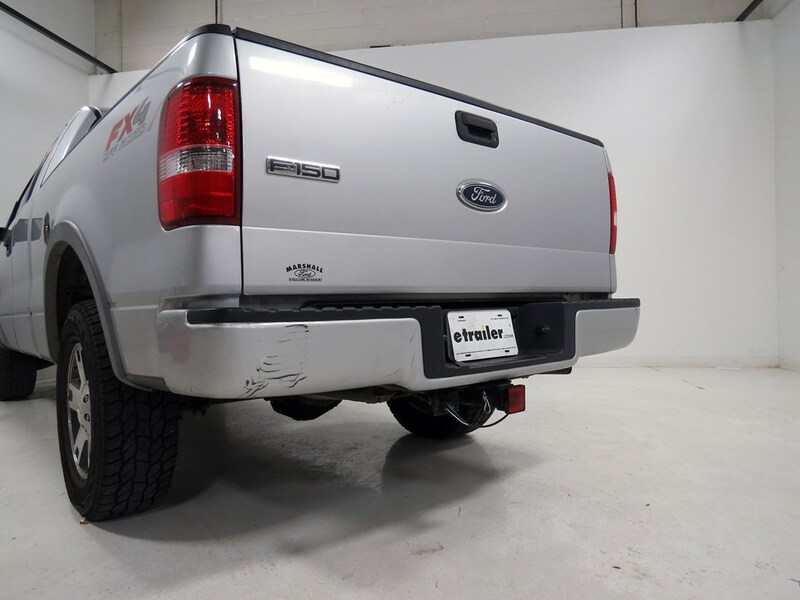 This 2" by 2" hitch receiver cover provides all the benefits of a regular hitch receiver cover, keeping out dirt and debris, with the added benefit of lighting up. It illuminates every time the brake pedal is depressed. It's powered by your vehicle's existing 4 pole and includes a foam gasket to help reduce rattle. It's constructed of a durable AVS plastic and the incandescent bulb is easily replaceable. Now that we've gone over the features, let me go ahead and show you how easy it is to install. You'll need to provide your own pin and clip. If you don't have one, that's okay, you can find one here at etrailer.com, part #PC3. Let's go ahead and feed into our receiver tube and line up our pin holes. That looks pretty good. Then we'll just take our pin and clip, put that through, add our clip, then we can grab our 4 pole connection, simply plug it in and then we've got it. Let's test it out. Works great. That's going to complete our look at the Pilot brake light trailer hitch receiver cover, part #CR-007. You can find this and everything else right here at etrailer.com. What's up man. Order: RelevanceNewestRating - High to LowRating - Low to High For added safety when you travel, keep this extra brake-light hitch cover in your receiver. Lights up to get attention of driver behind you. Long-lasting heavy-duty ABS plastic will keep for many years. Mark,Thank you for your review on CR-007. CR-007 is a 2 wire system that only illuminates when the brake pedal is pressed or right turn signal is activated. If you need a brake and tail light that connects to the 4 way connector. I would recommend part CR-007A. This light illuminates when running lights are on and brightens when brake pedal is pressed. Great products Rachael. Would definitely buy from you again. Thx for the follow up. The light is still working great, and there seems to be no problem with durability. Everything is working perfectly thanks. After one year the unit is working like new. Lights great looking at night. Been almost two years now and the light is holding up without a problem. Ive had others comment on how good it looks. Enough to put a lock on it so it can not be stolen. No problems with police in Michigan or Florida, but then again Im not responding to an emergency.Quote from Bob:This lighted hitch cover is illegal in Florida due to the fact that it has blue lights. State Statute 316.2397 2 prohibits the use of blue lights for any vehicle or equipment except police vehicles or the Department of Corrections when responding to emergencies. I am still happy with the trailer hitch tail light..It keeps the hitch clean and gives an extra light for other drivers to see..It has been on the Jeep for a year and it still actually works and looks like new..
Do you have a question about this Hitch Cover? Usually, people want the exact opposite; for it not to blink with either turn signal. 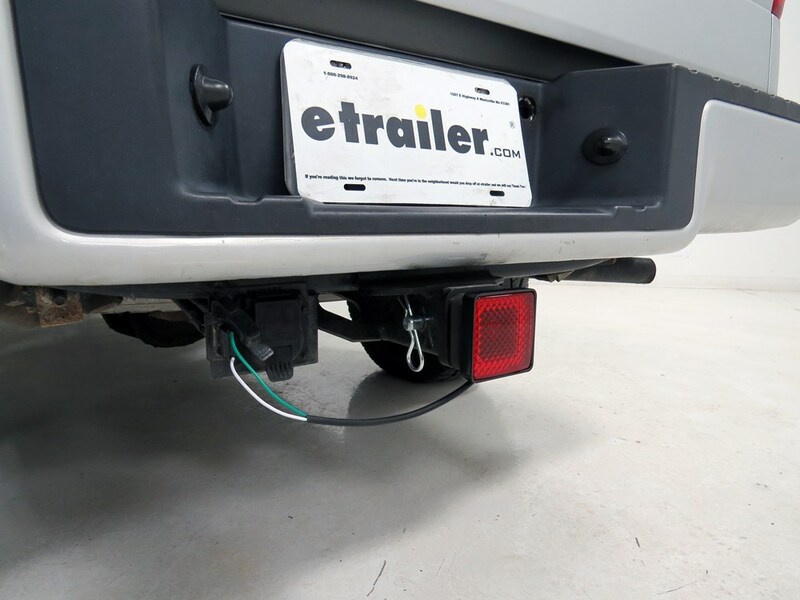 The reason that it blinks with just the right turn signal is because the 4-Way connector for a trailer has combined brake and turn signals and only one wire and a ground is used to power the light, in this case the green right turn/brake light wire. 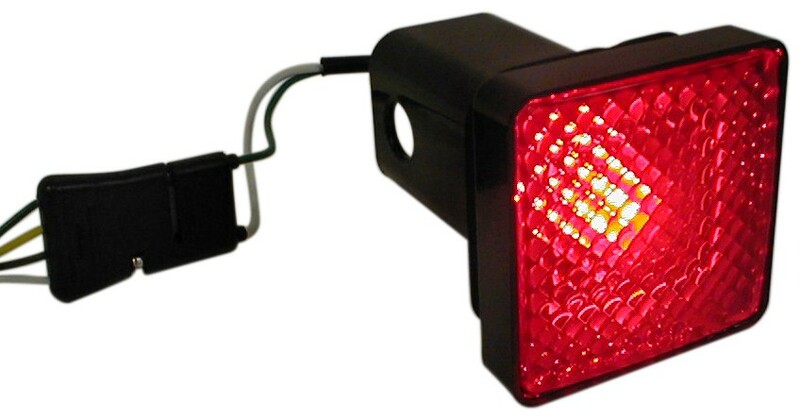 For a lighted cover that has turn signal functions you could use # CR-007XL. Light up hitch cover # CR-007XL will light up with the brake lights, turn signals, and tail lights. It fits in a 2 inch trailer hitch receiver and plugs into a 4-Way flat connector. I have linked a video review of this cover for you. 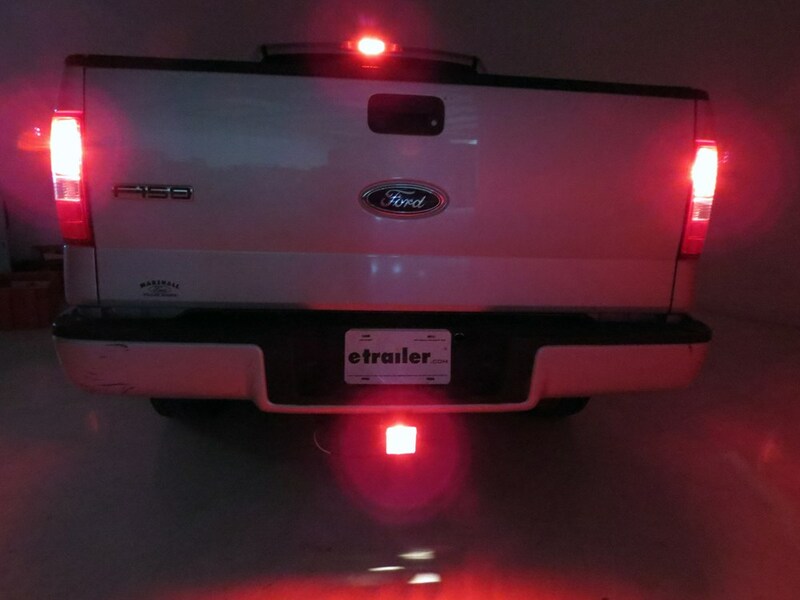 The right turn signal will come on with the Brake Light Trailer Hitch Receiver Cover, # CR-007. The reason is that it uses the right turn signal/brake circuit which is a combined circuit. However, Pilot did make a cover that will not blink when you turn on the signals. It is # CR-007A. It has a converter in line with the wiring that filters out anything but brake and running lights. It is designed for 2 inch trailer hitches. We do not manufacture the hitch covers we sell but we do offer many types, all of which I have linked for you. Although not a lighted model we do offer Masonic hitch cover # HCC11487. The Light-Up Rectangular Trailer Hitch Receiver Cover - Brake, Tail, Turn - 2" Hitches, # CR-007 uses 1157 bulbs such as # A1157B. The problem is in the vehicle wiring. Something is shorting out onto the power wire for the Brake Light Trailer Hitch Receiver Cover # CR-007 and putting power on that circuit at all times. I would trace the wiring of your 4-way back looking for corrosion or cut or exposed wire that could be causing the short and fix as necessary. This light should only come on with the brakes or the right turn signal comes on. I went out to the warehouse and pulled a Brake Light Trailer Hitch Receiver Cover, # CR-007. The correct replacement bulb is an automotive style bulb 1156. It also fits a 2005 Volkswagen Jetta. They do not offer a replacement lens for the Light-Up Rectangular Trailer Hitch Receiver Cover part # CR-007XL which means your only option would be to replace the entire unit. If you would like for a more cost effective replacement you may want to consider the Brake Light Trailer Hitch Receiver Cover part # CR-007 which is a brake light only. I have attached a review video for you as well. What you described is normal operation for the Pilot Hitch Cover part # CR-007 that you referenced. 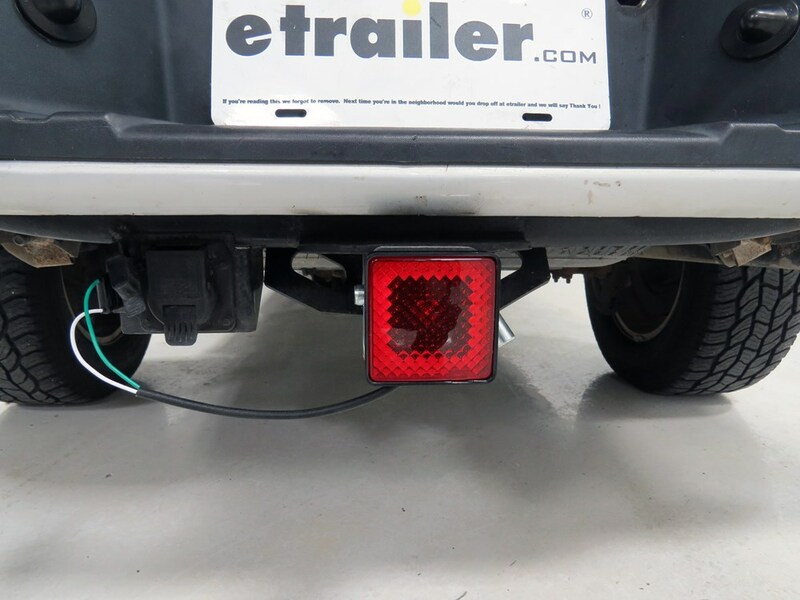 Since it activates using trailer wiring which have the turn signals and brake lights combined and this cover uses the right stop/turn circuit for activation. There is a version of this cover that has a signal converter which allows it to only get brighter with the brake pedal. For that you'd want the part # CR-007A. Highest quality hitch covers for the best price. Most detailed, accurate hitch cover information available.